I have just returned from flying a simulated emergency mission in Michael Black's full-sized Boeing 767 simulator described in part one of this series. Even while this rig is built inside the master bedroom of Black's Eugene, Oregon home, sans the full motion capabilities, it feels to me not that far removed from the professional simulators you'll find at the major training centers around the world. Before I get into the results of my experiment to see if a 500-hour, instrument-rated private pilot with zero airliner time could land an airliner in an emergency, I want to explain that I am resisting the urge to strut around the office doing the happy dance. Yes, you guessed it, I nailed this session, and brought this virtual airliner to a safe landing on 34R at KSEA, and it feels pretty cool. For full disclosure, I must admit to wearing the only shirt I own that has epaulettes on the shoulders for this session. I know, cliché...but hell, I wanted to NAIL this, and if the shirt made me walk with a touch more swagger and "fly" with just that much more confidence, it was O.K. with me. Black would set the sim up at a safe cruising altitude, and without explaining where any of the controls were, simply say that both of the virtual pilots had become indisposed, and were unable to complete the flight. 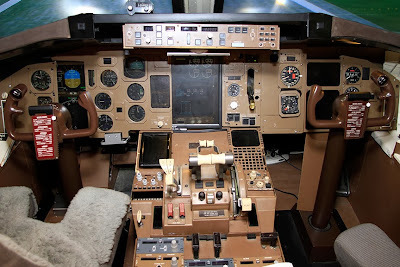 I would be the only other licensed pilot on the airliner, and it would be my task to slip into the left seat, determine what I needed to do to "fly" the plane, and then find an airport, slow down, drop gear and flaps, and land reasonably close to the runway without breaking the plane or causing injuries to the virtual passengers. This was an experiment I have always wanted to conduct, but the cost of renting a full-motion sim at one of the big training centers kept this from becoming a reality. But when I learned of Black's full-sized sim right here in my hometown, I HAD to finally answer this long-time nagging question. Black was perfect in this scenario...taking the plane off from KSEA, and climbing out over Puget Sound to FL200. When the plane was stable in cruise, it was my turn to see if this was going to end well, or be a most embarrassing day. The autopilot was in-op when I climbed into the left seat and began this drill. But with the virtual airplane weighing in at 350,000 lbs., everything was stable when I took over the controls. I immediately found the trim switch on the yoke, and could see numerous airspeed indications showing a speed north of 325 knots. Black would act as quasi-ATC, so the first thing I did was jump on the virtual radio and told "ATC" of my emergency. They (Black) said he would get a company rep on the landline, and was told to find speed bugs on the EFIS...which I never did find. I got a bit confused about the speeds, but did catch one important fact...that the virtual 767 would fall out of the sky in a massive stall at about 125 KIAS. I also forgot to ask about the approach speed again. I pulled the giant power levers back about half way and waited for the nose to drop a bit. It barely made any movement below the horizon. So I pulled some more...and more...and when it just wanted to keep flying, I asked "ATC" to ask company what my power settings should be. In a real-world emergency, I am confident ATC could put someone in my headset to talk me through slowing down the airliner. I was told "pull it all the way to flight idle" which I did. I am not sure if this is realistic or if it was just the way Black's sim was rigged, but when I pulled back and removed power, the nose dropped like the bowling ball falling from space. This got my FULL attention. But with a few ticks of nose-up trim, the descent and stabilized and the airspeed cranked down to a manageable 220ish KIAS. The resulting 2,000 FPM descent felt good, and both the EFIS and analog airspeed indicator were headed in the proper direction. In the turn, I really began to feel a sense of motion, even while this sim was stationary. Surrounding me were four 55" HDTV displays, with GIANT Fresnel lenses at just the right distance between the windscreen and TVs to simulate motion. I swear it felt just like a big airplane was turning, so realistic in fact, it made this task easier than I had expected. It was completely awesome to wrap my right hand around those huge power levers...an actual power quadrant from a 757. 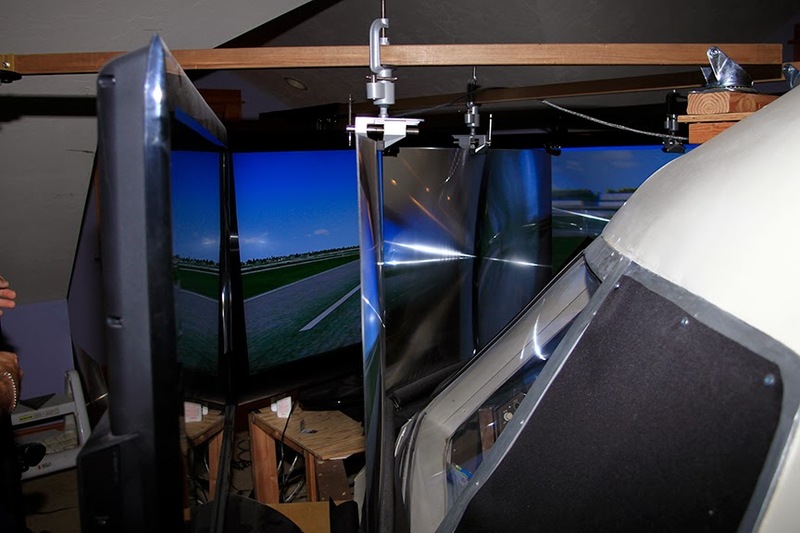 These were professionally rigged to command the five gigantic PCs that runs the sim, and there was an equal amount of realism in the way the yoke felt, and they way it controlled the airplane. I was lost in this virtual reality, with about 250 virtual passengers in back praying for a good ending to this story. I was not about to let them down. I guess I was fixating on steering to the runway, and lost my airspeed for a moment. When I saw 140 KIAS, with flaps at full and power at flight idle...one thing entered my mind. Asiana 214, KSFO. Here I was, maybe 5MN out, with my speed falling through the floor. So I pushed in some power...uh...too much, and the VASI went from a perfect red, red, white, white to four white. Yep...these engines have a bunch of power. So I pulled back some...but not too much, and got the VASI back, with airspeed now about 160...far enough above stall to keep the wings happy. 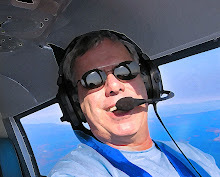 As I fiddled with the airspeed, I soon lost the centerline. It amazed me how fast this big ship wandered away from being aimed right at the runway. I might have spilled a few drinks on back when I cranked and banked to try and find the centerline again...and I think I stomped on the rudders hard enough to through the yaw police into full SWAT mode. But I was not yet on the ground...which was coming up FAST in my virtual windscreen. Now maybe 200 feet above the fence, my airspeed was on target but I just could not horse the 767 from being right of the centerline. So I decided that a stable landing on the grass might break a few things, but the people would live. But as I continued my wing rocking, ham-handed guidance towards the runway, something interesting happened. The airplane sort of mushed over to the left far enough to hear the definite THUD sound one hears when large, expensive gear meets...RUNWAY! O.K., so the right mains might have taken out a few runway lights...but in seconds, the third THUD of the nose gear meeting runway was heard...and I was DOWN! Black applied the brakes manually (the toe brakes were in-op) and I ended up leaving about half of 34R's 11,901 feet in front of the now parked 767. I had done it...and it felt amazing. I'd like to conclude this series by making a point that is important. While I did safely return this simulated airliner to an airport and land, by no means do I think I can "fly" real airliners. The basic stick and rudder airmanship involved in flying a Piper Cub and a 747 are related, but this exercise demonstrated that the skills needed to fly airliners with proficiency do not exist in the everyday private pilot. I did not have to deal with flight management systems, or the many other complex systems that keep an airliner safely moving from A to B. I also did not have to deal with real emergencies, or real-world weather. I now hold an even higher respect for professional airline pilots like my friends and fellow Formation Bloggers Karlene Petitt and Eric Auxier, who both fly for major carriers. These pilots are tasked with performing a ridiculously complicated job every day, and nothing but their "A" game will suffice. So for any private pilots to think we could realistic perform their job is a myth. All I proved with the successful completion of this simulated emergency scenario was that I have the hard-wired airman skills to understand how most any flying machine soars through an air mass. Yes, a wing is a wing...trim functions the same on large and small ships, and reduction of power indeed points the nose at Mother Earth. Two things I know are this: I will never, EVER have the skills to fly airliners for a profession. And, if ever in a situation where I am the only pilot left to fly an airliner to a safe landing, I am reasonably sure we'll all walk away from the real thing without a scrape.